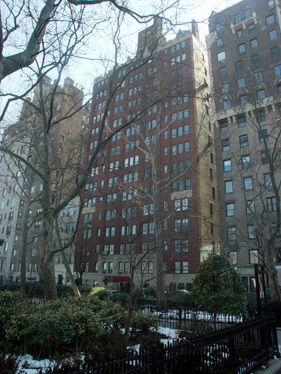 The short block of Gracie Square that faces the southern boundary of Carl Schurz Park consists of three mid-size luxury apartment buildings. Numbers 1 and 10 which anchor the western and eastern ends, respectively, of the block, both have unusual collage and asymmetric façades and frame this handsome, red-brick apartment building, which has a symmetrical façade. The building was erected in 1929 and converted to a cooperative in 1945. The 16-story building has 42 apartments. The building has a lovely sandstone base that is one story high except for around the entrance where it is two stories high. The building has very handsome bronze entrance doors and Art Deco-style lanterns. Its canopied entrance is unusual because it is suspended and has no "legs." The building has a handsome rooftop watertank enclosure and no sidewalk landscaping. 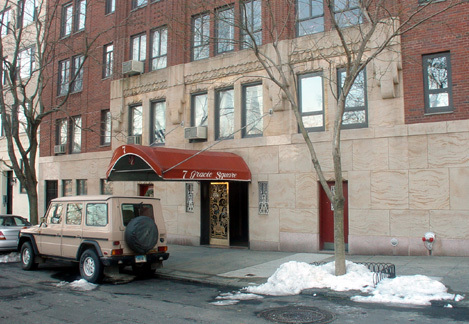 It has excellent views to the north over Carl Schurz Park, Gracie Mansion and the East River.